Methinks the aforementioned master of mirth has a point, so let’s dive and delve beneath the briny deep to greet some of nature’s fascinating creatures, like those pictured above hiding in the kelp. 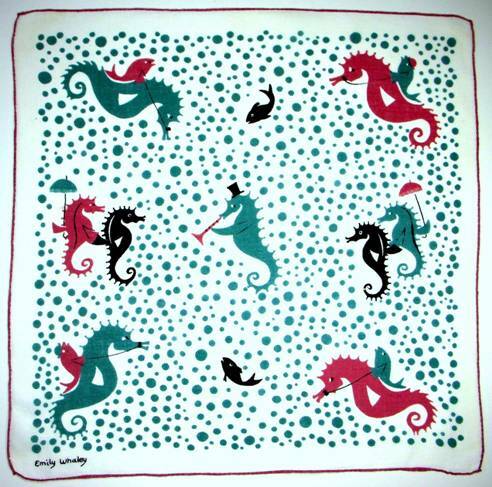 The enchanting and engaging seahorse is featured in countless variations of handkerchief design. In this French version, he brings good luck. 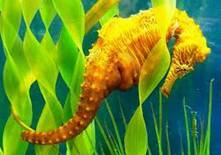 Scholars opine the name seahorse has been given to 54 species of marine life in the genus Hippocampus. 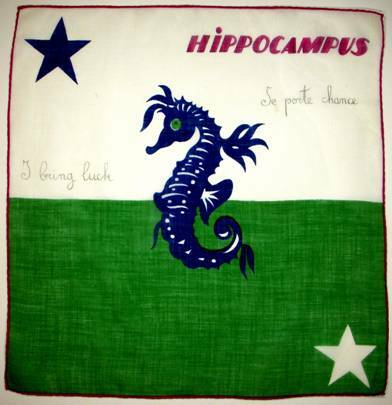 The word comes from the Greek hippos meaning “horse” and kampos meaning “sea monster.” Ancient Greeks and Romans believed the seahorse was associated with the sea god Neptune/Poseidon, and thus considered a symbol of strength and power. 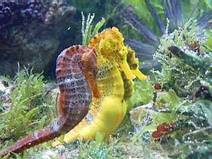 Ancient Europeans believed the seahorse carried the souls of deceased sailors to the underworld, protecting them with safe passage to their destination. 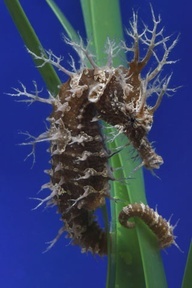 The Chinese believed the seahorse to be a type of dragon, a symbol of good luck. 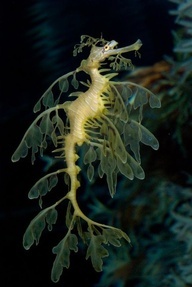 Because they are slow swimmers, (one of the few species to swim upright), and because their spiny bodies have not evolved much over centuries, they are also seen as symbols of patience and contentment. 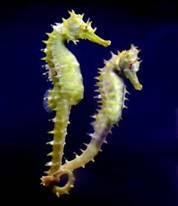 Last year, the Monterey Aquarium featured a seahorse exhibit, and I was astonished to find some species that could only be seen under magnification. You could have fit ten little seahorses on your thumbnail. My favorite by far were the creatures camouflaged to resemble sea kelp (image on the left) and were mesmerizing to watch. 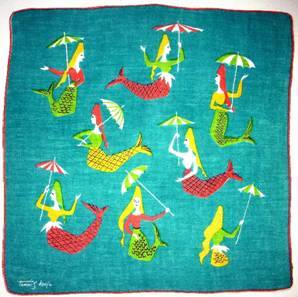 Here’s a fun and fanciful fashion accessory to brighten any beach ensemble. 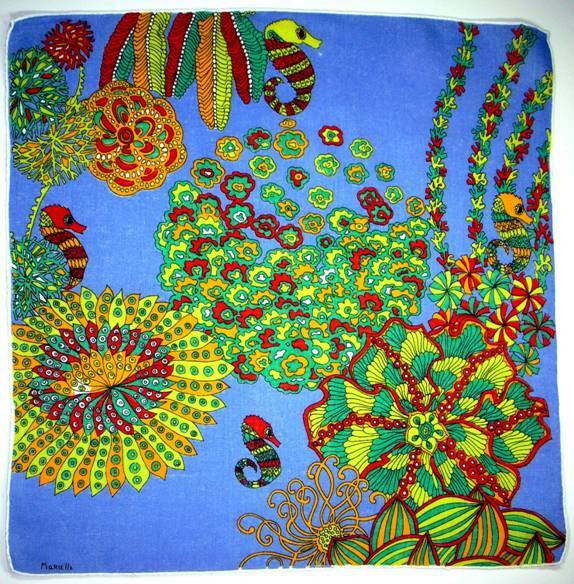 Can you spot all the seahorses? The creatures ranged from pink to gold to every color in between including snow white. 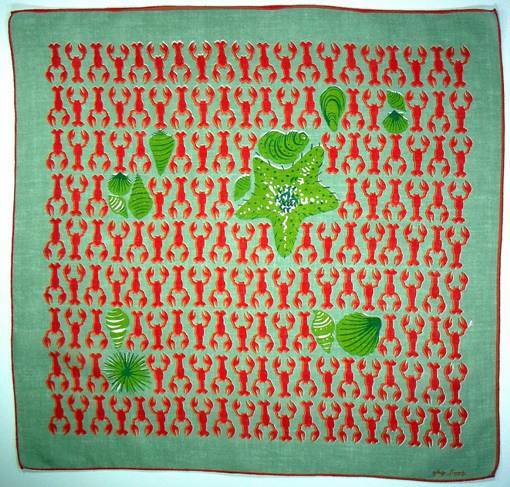 Many traveled in pairs, as seen in the photos above as well as this bubbly hankie below. 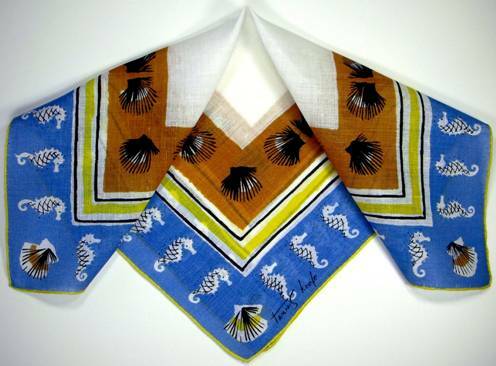 Here’s a beauty, with just the right contrast of sand to surf, shells to seahorses. Divine. While we wax poetic on the spectacular seahorse, let’s not forget the amusing and entertaining lobster. 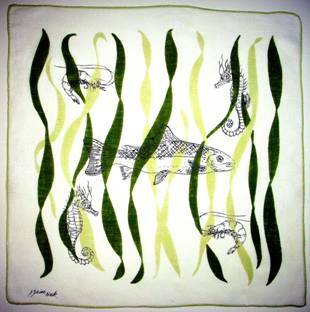 His terrific image has adorned all manner of tableware – napkins, tablecloths, etc. for decades and we never seem to tire of his red-hot image. Even Kate Spade has taken to putting him on contemporary bandanas. 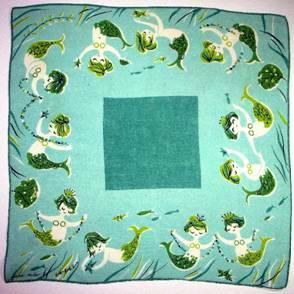 But they’re no match for these classics from the 1950’s and as usual, no one does it better than Tammis Keefe. A band of buddies border this beauty, and the fish in the center don’t stand a chance. Have the tides turned for our fearless fighters in this sea foam spectacle? 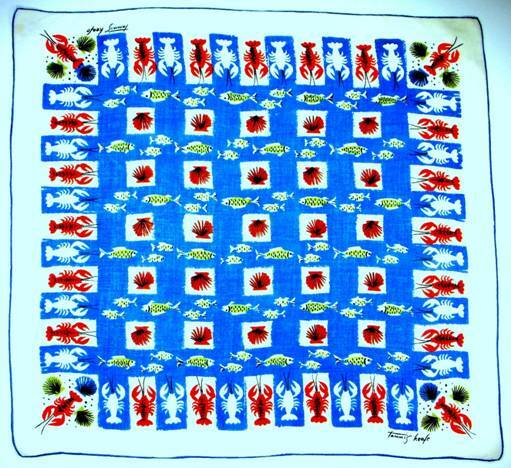 Phalanx of crustaceans interspersed with starfish, sea urchins, and clams crowd the canvas as though caught in a net. The colors are perfection, and although nearly 70 years old, the image is as sophisticated, fresh, and timeless as any designer creation of today. Yes, lobsters make terrific graphics, but they also make terrific bisque, Thermidor, Newberg and more. 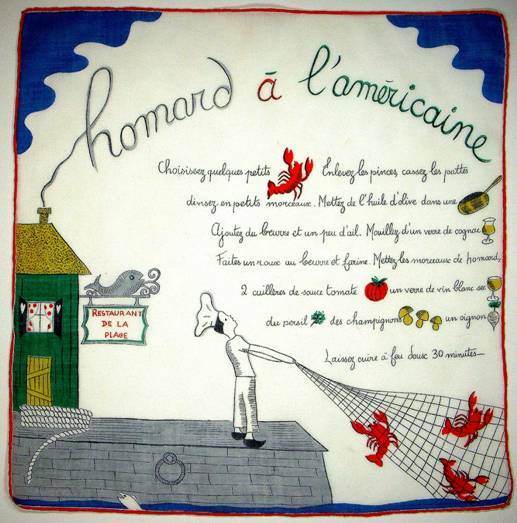 Here’s a yummy French hankie to tickle your fancy as well as your taste buds. Being a lefty, as an adolescent I subscribed to Lefthander Magazine. (This was long ago and I believe the magazine is now defunct.) I still recall a story they ran about lobsters. Who knew there were left-handed and right-handed lobsters? The article stated that if a lobster loses a claw, he is able to grow a new “bud” which eventually replaces the lost claw. Researchers were studying lobsters to determine how they grew limbs, with the hope of learning how humans might regenerate lost limbs. Now there’s a tweet for you! The larger claw is used for crushing, the smaller claw for ripping. Lobsters can be blue-green, blue, red, yellow, red orange and white. Some lobsters are two-toned, with half their shell one color, and the other half another color. 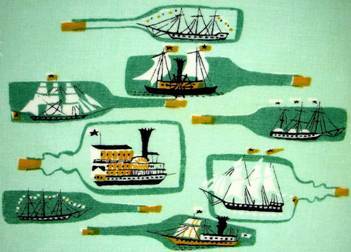 We can’t visit the seashore without giving a dip of the sail to the age old art of “ship in a bottle.” Spending months or even years at sea, sailors often filled the endless empty hours with intricate handwork to occupy both mind and hand. 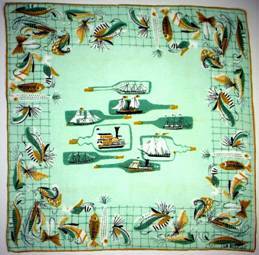 Some are quite remarkable, and this hankie showcases everything from a schooner to a brigantine to a four story paddlewheel. If you first consume the bottle’s contents with gusto, you might even spy a bevy of mermaids frolicking in the foam. From there, it’s only a sea shanty away from spying Jonah himself. The lesson of Jonah from the bible is that you can’t run away from the Lord. He will find you even in the belly of a whale, and indeed, that is where “Mr. 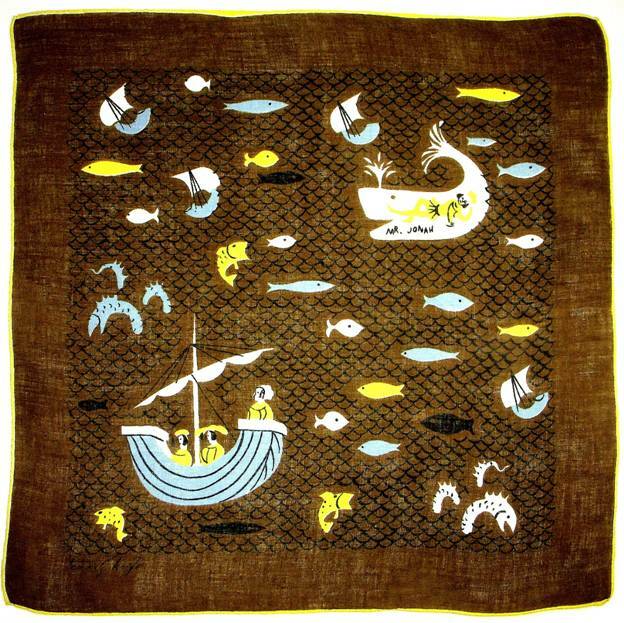 Jonah” resides in this terrific rendition of the tale. 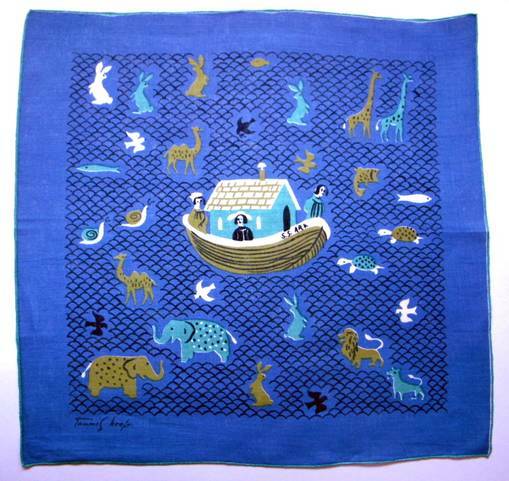 Another watery tale rendered in brilliant blues depicts Noah and the Ark. I’m at a loss to identify the third passenger, but we’ll chalk that up to artistic license. Note the subtle humor – the rabbits have already started multiplying. I’m frankly in awe at the astonishing variety and beauty in your collection of handkerchiefs!! Your writing is as brilliant as the colors in this blog. Thank you so much for your work! You are a wonder! My son would love these, being the underwater navigator that he is!